Cytogenix have reformulated Xenadrine Ripped and now have Xenadrine Ultra! Supports Weight Loss, Helps to Boost Energy and Helps to Burn Calories. Get Research Strength Weight-Loss Support That Really Works! Weight-Loss support can now be yours, thanks to Xenadrine Ultra. This incredible formula contains key ingredients that support weight loss! Xenadrine Ultra supports weight loss for the body you want, along with an appropriate program of diet and exercise. It will help you feel a boost of energy from the very first time you take Xenadrine Ultra. Xenadrine Ultra contains researched key ingredients shown to help support significant weight loss. 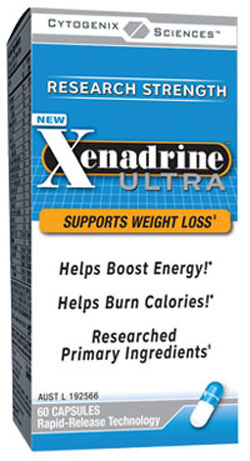 Another key ingredient in Xenadrine Ultra supports calorie burning and helps boost energy. Trust Xenadrine Ultra to support your weight-loss goals. Imagine how much weight you could lose with Xenadrine Ultra as part of your own sensible diet and exercise plan! Can You Build Muscle With Plant Protein?